Synopsis : Dan and Shiuli are both 21 year old hotel interns working at the same hotel. Life goes on until a sudden turn of events smashes Dan and Shiuli's lives together into a bond that's unlike any other. A Meditative Take on Autumnal Love! Somewhere in the middle of the second half of October, I felt a single tear sliding down my cheek. What caused it? Was it some good old-fashioned melodrama that caused me to tear up? Nope, this film has none of that. Was it some heartfelt emotional outburst from one of the characters? Nope, this film has none of that either. Was it seeing the death of some character. Nope, that was certainly not the reason. Logically speaking, there was absolutely no reason I should have teared up. As humans, we spend a large part of our lives getting on with our work, and in the process, we learn how to shut out our emotions. Watching October, you get the exact same feeling. Throughout the film, the unsaid emotions are all bottled up and some of the most eventful sequences take place so organically and without any fuss. It's a strategy that director Shoojit Sircar has used to similar effect in his previous films. Take for instance, the death of his major characters in his previous films Madras Cafe(2013) and Piku(2015). It is to writer Juhi Chaturvedi(of Piku fame)'s credit that her script never for once attempts to emotionally manipulate her audience by making them empathize with the characters, ponder on the after effects of a tragedy, a nightmare or a morose circumstance. Instead, her script allows the sadness of its characters to envelope you ever so gradually, so that by the time you actually begin to notice the first signs of love blossoming between the two leads in the second half, you let out a teary chuckle. As for Varun Dhawan, fans of the comic, action and dancing hero may inevitably be in for a major disappointment since there is not a single trace of the superstar that you get to see in this film. Post his anti-hero act in Badlapur(2015), there was never any doubt about his acting caliber and his choice of slipping into a dark character so early in his career was applauded. With October however, Varun has a far more difficult job since this character has neither the commercial trapping of his mainstream roles, nor does it demand the intensity of his character from Badlapur. There is a clumsy innocence about his character and the honesty with which Varun approaches this role that makes you believe in him. 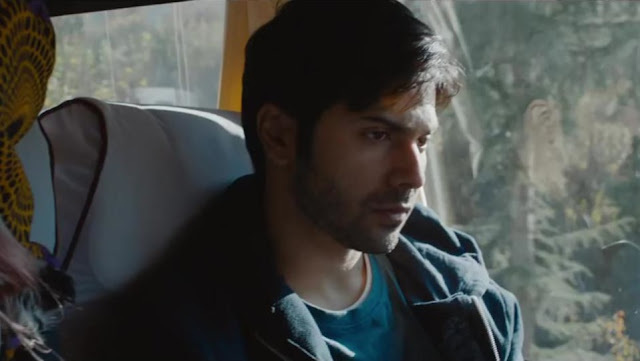 Having said that, there are a couple of scenes in which Varun struggles to internalize his sorrow, and you wish the director had opted for a much more accomplished actor. Despite having barely five dialogues in the entire movie, newcomer Banita Sandhu as Varun's co-worker Shiuli leaves a lasting impact. Gitanjali Rao shines out as Shiuli's mother. There is something about the way Shoojit Sircar adds Delhi as an intrinsic character to his films. If the rough and raw humour of Vicky Donor(2012) captures the beating heart of Old Delhi, then with the lovable father and daughter duo in Piku, he shows us a more fun part of the city. In the gritty and dark Pink(2016), he uses pollution to capture the rotten mindset that has pervaded the male youth in the underbelly of the capital city. With October, he uses cinematographer Avik Mukhopadhyay to show a much more poetic side of the city. While Shoojit manages to personify the city as a character, writer Juhi Chaturvedi goes a step further by characterizing an entire season. So while the film does not necessarily unfold in the month of October, the month has a special relevance to the story. Shantanu Moitra's melancholic instrumental beautifully captures the film's theme on autumnal love and stays with you long after the film ends. October is not a film for those who do not have the patience to watch a seemingly simple and quiet film, that takes its own time to unfold. Just as love takes its own time to blossom, you need to experience the film. No heavy stuff, the film uses a season to evoke the one true human behaviour called love. Recently, world renowned Iranian filmmaker Majid Majidi spoke of his love for Indian cinema and how it needs a revolution to return back to the days of Satyajit Ray, when cinema was simple on the surface, but had a great impact at a deeper level. I'm going with 3/5 and an extra half star for the simplicity and sincerity with which the trio of Varun, Shoojit and Juhi have churned out a novel-like film that comfortably sheds off its commercial skin to give us a cinematic piece that's similar to what Majid Majidi described.